Machinery can constitute a significant part of an infrastructure investment, so make sure equipment suits the feed you will be delivering to the feed pad. Mixer wagons are purpose built for mixing a range of ration ingredients. There are three types: paddle, vertical, and horizontal mixers. Different mixer wagons have different power requirements of the tractor needed to operate it – e.g. paddle mixers require less power than vertical or horizontal mixers. Match the tractor to the mixer wagon. Ensure the tractor is large enough to tow a full wagon safely on slippery or sloping surfaces. Useful for simple mixing of dry feeds but be aware that long, fibrous materials can separate out and uneven mixing can occur. Fit load cells to weigh ingredients. Cannot mix minerals, feed additives or urea. 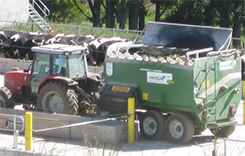 Silage carts are designed to deliver chopped silage but can also be used for crude mixing by layering various feed ingredients in the wagon. Note that uneven mixing may occur. Can have high wastage if cart has a wide feed-out. Err on the side of big if you are building a large feed pad or freestall – most farmers who’ve already built say they wished they’d purchased larger mixing machines and tractors.